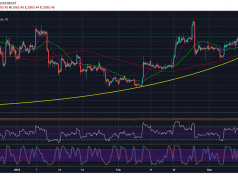 Bitcoin (BTC) maintains its parabolic trajectory as price consolidates before a strong rally past $4,000. The price is expected to close this week below $4,000 with the possibility of a strong rally as early as next week. The 4H chart for BTC/USD shows that the price is currently resting atop the parabolic support which also coincides with the 50 MA on the 4H time frame. Prior to that, the price found support on a level that coincided with the 200 MA on the same time frame. Trading conditions on the 4H time frame are favorable for a short term rally to the upside which will force the bears to close their short positions and encourage the bulls to go long on Bitcoin (BTC). The long term outlook of Bitcoin (BTC) is unaffected by these developments. If Bitcoin (BTC) had closed the week above $4,000 a few weeks back without the strong pullback, maybe the situation would not have been so complicated. However, now the situation is quite complicated for the average trader to figure out what is going on. As always, it is a good idea to assume that the obvious is not going to happen. The obvious in this case is that BTC/USD is overbought on the weekly time frame and the price is going to decline sharply sooner or later. A lot of retail bears rushed to open short positions but the obvious never happened and now we have Bitcoin (BTC) preparing to climb strongly above $4,000 which is going to be completely devastating for the bears. The daily chart for BTCUSDShorts clearly shows that the bears are closing their shorts in a hurry in anticipation of a strong move to the upside. However, the number of margined shorts has yet to decline to the bottom of the descending channel. This means that in the days ahead, we will see an even strong decline in the number of margined shorts which will push BTCUSDShorts in oversold territory. Yesterday’s close below the 21 day exponential moving average for BTCUSDShorts confirms a bearish continuation which means we will see the number of shorts decline further. Bitcoin (BTC) has a very high probability of going higher from current levels. However, it is important to realize that BTC/USD has yet to find its true bottom. No matter how high the price goes short term, it will eventually have to decline to find its true bottom. While most of the retail bears were right to assume that the price would go down, they obviously had bad timing which will become even clearer in the days ahead. As for the bulls, near term price action might lure some into opening aggressive longs which may not appear to be unreasonable after more than a yearlong correction that wiped out more than 80% off the market cap of Bitcoin (BTC). However, no matter how bad things are, they can always get worse which is why traders should be very careful with their leveraged positions especially in periods of such low volatility.